Limited and unlimited at the same time: the Laco editions. Special occasions, requirements or demands also need a very special watch. For this reason, the Laco watch collections are still characterized by limited editions, that our on-site watchmakers in the Pforzheim factory assemble with great attention to detail, great passion, and a lot of expertise. The watches are limited in number, but leave nothing to be desired in terms of striking design and exceptional quality. In other words: ambitious timepieces, clearly structured and with excellent design. 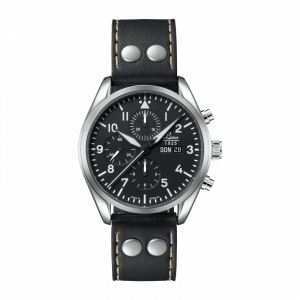 Racing to the finish with 49 pieces: the Laco Mission Manx Limited Edition. 60.7 km of extremely winding and steep roads: The Isle of Man Tourist Trophy is considered the most dangerous motorcycle race in the world - and has inspired us to create a special limited edition. The result: the Mission Manx model, limited to 49 pieces, in honour of Georg Meier, the first German winner of the race in the senior class. The ETA 7750 automatic movement with day and date display at three o'clock ticks away inside the 44-millimetre stainless steel case of the chronograph. The rotatable black bezel wins you over with its special details on the record lap time of Georg Meier ("TT 1939 Georg Meier/25.008") and the printed Motor Circus logo on the zero point. The Tourist Trophy on the Isle of Man is probably the most infamous motorcycle race of all time. Until 1939 only the English had won at this track. Then "Cast Iron Schorsch" came to the starting line. With his 500 BMW compressor "The German", aka Georg Meier, chased over the 264 miles as if in a dream and presented the native Manx People with a flawless performance. And secured the highest accolade of motor sport. A performance that still has not been forgotten. 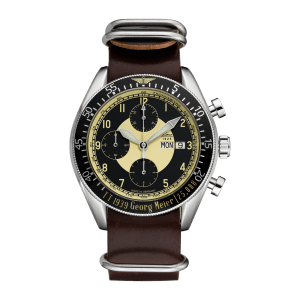 The Chronograph Laco Mission Manx Limited Edition watch is a tribute to an exceptional driver, his tremendous athletic performance, and technology that is reliable to this day. Classic function, the highest standards in reliability and processing, and a limited edition of 49 pieces - Meier’s' starting number - let the wearer relive the history on their wrist. Designed by five motor-enthusiasts, the clock was tested on their iron BMWs on the road to Isle of Man. Wind, weather and asphalt breathed the spirit and history of the legendary Tourist Trophy into the material of this chronograph. The only one who requires more from our service than our customers, is us. A Laco is a statement. A statement for the original. Because every Laco watch sets the standards in its category and stands for high precision, high-quality manufacturing, and passion. A claim that can also be made when it comes to the quality of our service. 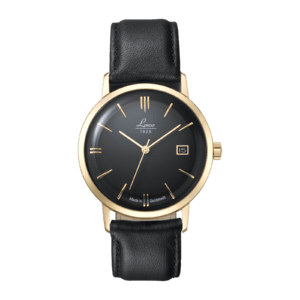 Quality over quantity: Laco watch manufacture. A Laco is more than a watch. It is an expression of character. Because, no matter whether you wear a robust aviator watch, a precise chronograph or a timelessly elegant classic on your wrist: each Laco has a unique character, which is distinguished by the love of detail and passion, with which our watchmakers built it: with complex and sophisticated craftsmanship. Regular good news: our newsletter.